SALE PRICE $13,995 SAVINGS OF $1,000!! HISTORY: This Journey is a local BC Vehicle. Clean vehicle with no insurance claims, and no accidents! It has been well serviced in Maple Ridge. There is no major body damage or scratches. INSPECTION: We have done a full mechanical safety inspection on this vehicle. It received new tires, new rear brake pads and rotors, and a new air filter. CALL 604-467-3401 TODAY @ Maple Ridge Hyundai! 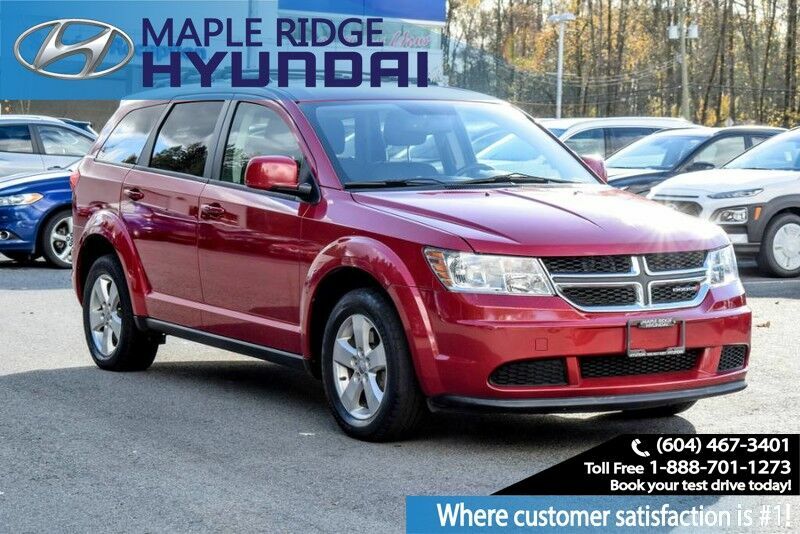 • Save thousands on Premium Pre-owned vehicles! I just recently purchased my second Veloster from this dealership and both of my experiences were beyond excellent. Taylor was polite, friendly and very easy to work with. He’s been making sure I’m happy with my car. And even when I’ve bugged him on his days off, he was still nice to me and went out of his way to help me out. My wife was even jealous of the service I got compared to what she got at another dealership she had dealt with. I’m going to continue coming back to them and recommending them to friends and family as long as they are around. Keep up the good work Taylor and the rest of Maple Ridge Hyundai team! I have purchased my Plug in Sonata Hybrid from here in December. I average 1.7l/100km so far. I am looking at getting over 3000km on my current tank of gas. This car is very comfortable to drive and has lots of pip. I am definitely enjoying the gas savings. The only down fall with this car is the trunk space and the rear seats do not fold down. If you are looking for a new car this would be a great option has you do not have to worry about gas prices or running out of battery power. Go see Brent for great experience in buying a new car. By far the best car buying experience I've ever had! This is the 3rd car I buy from this dealership and plan on buying from them for my next ones as well Ask for Brent to get an absolutely open and honest car buying experience with no surprises. He worked tirelessly to fit my exact wants and needs in the perfect vehicle for me! Thank you Brent and your team for the continued fantastic service you provide! Brent, the most approachable and cooperative personnel to come across. He has always went up and beyond to make our process of buying a car the most easy and fast one. I would highly recommend Brent and Maple Ridge Hyundai to anyone who is looking to get into a vehicle. Great help from Mr.Oliver Evans. I would definitely recommend my friends to look for Oliver for cars. I have deal with lots customers service guys in past years and Oliver is the most fantastic satisfied salesman, he is a very professional with highly qualified. Thankyou Mr. Evan's! Sheldon Lloydsmith was absolutely fantastic! Purchased a brand new vehicle for my wife and he went above and beyond in every aspect of the deal. If you go to maple ridge Hyundai, ask for Sheldon L & you’ll be in good hands + you’ll be driving your new vehicle off the lot!! Not pushy, genuine and knowledgeable! Really respects your wants and needs. Great guy. Taylor Berge has been awesome! We love our new car and he was quick on helping us get everything sorted! Will definitely keep working with this team. I bought my first car from Hyundai. I had the pleasure of working with Brent. HE IS THE BEST!!!! I will most definitely come back. Everyone at Hyundai is very friendly and helpful. Brent has helped my family for years and we wouldn’t trust anyone else but him for vehicle. Usually, I don’t write reviews, this time I feel I must. The experience with this dealership has been very positive, especially with the salesman Marcus Pinto. I found the car I wanted to buy online, and emailed them the inquiries. Marcus replied very efficiently and sent me all the reports I requested. In the negotiation, he showed his patience and willingness to help in a friendly manner, which I don’t see that in every salesman. I think that is a true quality required to be a good salesman. In this competitive business world, customer services do matter! Two days later, we drove our car back with all the requests been taken care of. Happy ending, no regrets! I will definitely return in the future. My experience at Maple Ridge Hyundai was excellent. The thought and care that Brent put into finding me the right vehicle was that of true knowledge and understanding. I felt like I was dealing with a family member as he took my needs and wants very seriously and was able to find the best vehicle for me. Brent and the team made it very easy and comfortable for my husband and I to purchase my vehicle while being able to stay within our budget. I recommend anyone to visit Maple Ridge Hyundai and especially to see Brent. Thanks again for everything! It took some time but the matter with the key was satisfactorily resolved. Thank you, Maple Ridge Hyundai, and we look forward to further business with you. i have bought a few cars in my lifetime.. I have NEVER, I repeat, NEVER had the continued service that I am currently getting from this dealership. Will I buy another Hyundai?? There is absolutely no doubt about it! vist the team at Mapel Ridge Hyundai and you will NOT be disappointed!